Most people assume that technology is a game-changer for children with disabilities. Using it helps kids to walk faster, wheel further and communicate better. You can see the difference it makes. It levels the playing field. It turns disability into ability. Why is one in four assistive devices abandoned by families? Why do 50 per cent of Canadian parents with children who lack functional speech say that none of their child’s communication technology needs are met and a further 20 per cent have only some of these needs met? Why do more than 3,000 American children who use wheelchairs and walkers have serious falls that result in trips to hospital emergency departments each year? What we do know is that assistive technology can be pricey. This is partly because many devices must be custom-made or individually adapted by clinical teams. It’s also because the market for these products is small and spread out geographically. We are fortunate to live in Canada. Our healthcare system provides universal coverage for medically necessary services based on need rather than ability to pay. Provinces must meet the conditions set out under the Canada Health Act to get an annual share of $30 billion dollars in federal funding for their health insurance plans. Yet the Act is silent on what services are medically necessary. That’s why provinces vary widely on which technologies they fund. Ontario’s coverage is substantial compared to many. The province funds about 75 per cent of most “essential” assistive devices for everyday activities. Wheelchairs, walkers, speech devices, powered prosthetic hands, and ankle-foot orthoses are among 8,000 devices co-funded by the Ontario Ministry of Health and Long-Term Care through its Assistive Devices Program. The program requires rehab professionals with special training to assess device need, discuss options with children and families and prescribe equipment. Families must buy or lease their devices from registered dealers to get provincial funding. Technology teams must also teach children and their families how to use some devices. With all of these checks and balances, isn’t it reasonable for families to expect that these essential technologies will work? 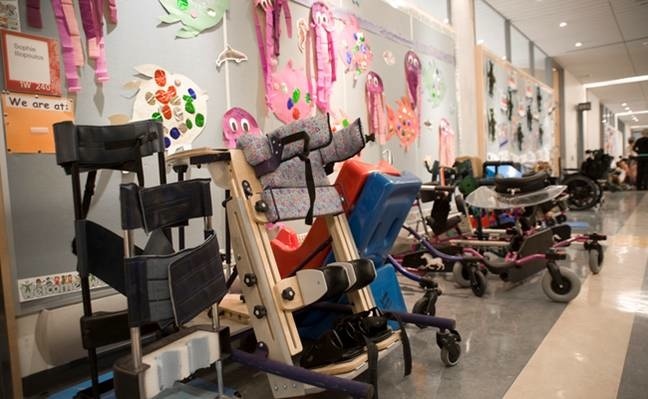 As a research engineer at Holland Bloorview in the ‘80s and ‘90s, I teamed with therapists, families, and manufacturers to develop better wheelchair seating, custom car seats, and special toilet seats for kids who needed support to sit. Under controlled conditions, we showed that kids who used our seating devices sat straighter and wheeled a chair better. We crash tested our special car seats to prove they were as safe to use as car seats sold in Toys-R-Us. We demonstrated that kids could sit on (and use) our toilet seat product on their own without being held by Mom or Dad. We assumed that this meant that our devices worked—and that they would work the same way in the real world, in family’s homes and communities. We think differently now. We recognize that benefits we observed don’t necessarily translate into lasting changes in how a child functions in the real world. The International Classification of Functioning, Disability and Health (ICF) is the World Health Organization’s framework for thinking about measuring function: a child’s ability to do and take part in everyday activities. The ICF views function as an outcome of the interaction between the child and his environment. It considers technology as an environmental resource that can influence a child’s everyday activities. So we think more now about how devices help kids and families do the things they want to do. Our teams consider how and why technology may help kids develop and their families live better. We are developing much better ways to measure functioning that may be affected by devices. We ask families questions that go beyond “How much do you like the device?” We focus questions on activities that may change after getting new or different technology. For example, we want to learn how communicating with friends and asking an unfamiliar person for directions changes after getting a new communication device. Or whether, with a specially-designed seat, a child can now sit at the table to eat dinner with the rest of the family. Of course we realize that we need to give children time to learn how to use a device and for families to work it into daily routines to really understand its influence. Important life changes may take days, weeks, or months to see. Sometimes changes may not happen. And sometimes no change is a good thing. For example, technology may enable a child with a degenerative condition to maintain an ability he or she would otherwise lose. We know that products and services may affect children and families in different ways. Our teams observe and ask questions many times before and after kids get their devices because how they use them may change with time and among family members. The tricky part is being able to understand how much change is due to the child’s device, something else we measured, or something we may have missed. For example, consider a mother with young children in a small apartment. She may decide that even though a special seat that allows her child to sit independently on the toilet works, the product is too bulky to store when not used. She’d rather hold her child on the toilet. Or perhaps stress in the family—a sibling birth or a return to full-time work—means that parents can’t follow through in supporting their child’s use of a communication device. So technology that seemed to support a child’s communication needs loses its impact at home. Sometimes parents working on many goals with their child that involve technology and therapy simply can't do everything at once. This is why we need to ask lots of different questions and use different strategies to study the impact of technology. Exploring the difference it makes will give researchers, service teams, manufacturers, policy makers and families clues about how, when, and what devices should be used, recommended, developed and funded. Most important, understanding functional outcomes will help us to predict when technology that works well in the clinic will work well in real life for children and families. Steve Ryan is a senior scientist in the Bloorview Research Institute.